As more and more people are frequently traveling across the borders not only to spend some memorable time with their family and friends, but also to expand their business. They may face difficulties in obtaining a visit visa to certain destinations due to political unrest situations and policies. Sometimes, they don’t have time to wait for approval, as there is some business urgency. They can conveniently avoid such situations after acquiring the nationality of a foreign country, which will enable them for visa-free entry into certain countries. All they need to do is to carefully select the territory to enjoy the benefits. 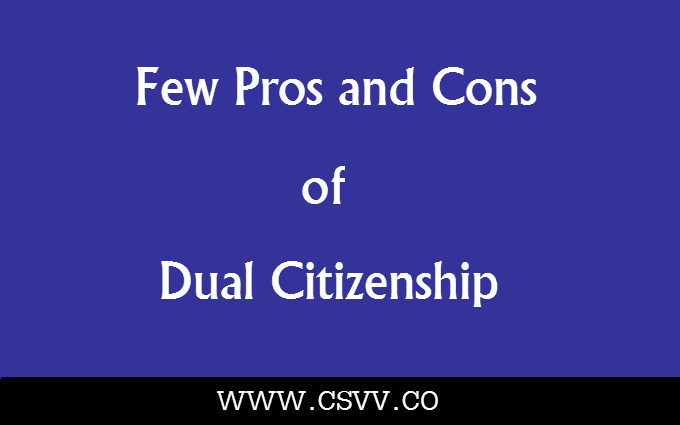 Here I am sharing pros and cons of dual citizenship. Being a businessman or an investor, you are repeatedly traveling abroad and thinking to acquire a legal status in a foreign country to remove such barriers. Here I am sharing a few pros and cons of practicing this legal activity, which might help you in making a well-informed decision. This is one of the major benefits associated with dual nationality. You may also become eligible to purchase or invest in a real estate property or business in a foreign state. Moreover, you will be free to move between two countries without applying for passports. After obtaining the certificate of the second country you will be issued a work permit. There are organizations, who don’t hire the candidates that don’t possess work permits. This is because granting work licenses is sometimes difficult for companies. They welcome individuals who either possess a nationality or passport. In addition to live, work and invest like a local, you will also get all the benefits state government offered to its native citizens. Dual citizenship permits individuals to cast a vote in the election along with permissions to run a business across the territory according to country laws and regulations. In case you have kids, they will also be eligible to get the education in local institutes at same fees. Besides offering the visa-free entry in a country you have chosen to avail the local rights, you will also be eligible to visit several countries without applying for a visa. Or few of the state’s sanctioned documents upon arrival at the airport. This will actually benefit those who have business and family in a foreign state. Now let’s discuss a few cons. This totally depends on the tax laws in your home town and the territory you are applying for the placement. If they impose taxes on all kinds of income or assets, you possess, you will be liable to pay that tax. It is suggested to consult with a tax professional to avoid overpaying on any taxes. You have to be very careful while traveling internationally, as the authorities don’t allow anyone to show different passports at entry or exit. You should be very sure about the identity you are going to show to an immigration officer. This is one of the major cons associated with second citizenship. There are countries who don’t offer nationality to foreigners, unless they don’t renounce their association with their home country. Irrespective of the reason you are seeking to avail a residency, consider these pros and cons to make a well-informed decision. Sheharyar Ahmed is professionally a Digital Marketer, author, strategist and blogger by passion. He is founder of Muscle O Mania & Co-Founder of VPN Garage. He loves helping people and companies in all aspects of Online Marketing. For any online & digital consultancy, feel free to contact him.